If you had asked me right after Springsteen’s December 6th Anaheim show to sum up the performance in one word, I would have said “exuberant.” Then I read the reviews the next morning, and everyone was talking about how “angry” the show was. The reviews I read attributed it to Tom Morello and Mike Ness, the guest stars of the evening. The guys gave added energy to the aging E Street Band, but their very presence, according to these reviews, left us with a more angry Springsteen, though it was a reference to the theme of the evening, not the actual emotion coming from the artist himself. It wasn’t till I was in Phoenix and saw that show that I could see this more clearly. The joy I felt in Anaheim, was no doubt, the joy I felt seeing my favorite band, up close and personal in the pit. Still, I think it is a stretch to call the show angry, and to be honest, I really didn’t think in terms of a “theme” while I was watching the concert. I see now, though, that you can’t have a show featuring “This Depression,” and “Ghost of Tom Joad,” much less one of my all-time favorites, “Adam Raised a Cain,” without feeling some anger slicing through the lyrics. Then there were “Spirit in the Night,” and “E Street Shuffle.” Those are songs of Springsteen’s youth, and our youth. It’s easier to feel a bit grumpy now, whether it’s because we are beaten down by the economy or just beaten down by the years we’ve added to our lives. 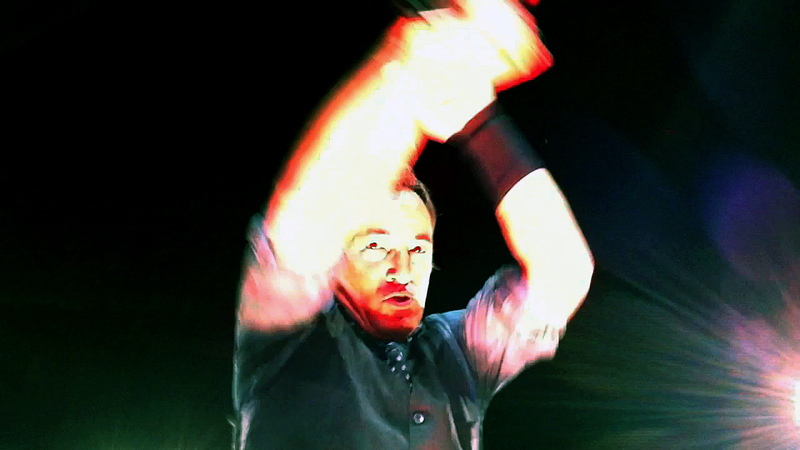 There has always been anger in Springsteen’s songs, which is one reason the faithful fans love him. He expresses the anger we feel when our lives have not gone as hoped. The other reason we love him, though, is the happiness and hope just at the perimeter of so many of those songs. In fact, as mentioned in the last post, the show opened with “Land of Hope and Dreams.” Sure, it was a nod to Disneyland being down the street, but the song sort of sums up all the other songs and characters Springsteen has created. They are all about surviving in, or maybe escaping to, the place where dreams are made of. Morello wasn’t just a guest. When the band walked out onstage, they walked out with him. No one was surprised that he was there, we were all a bit surprised to see him walk out like he was part of the band. This promptly started a rumor that if Steven or Nils, who are both getting on up there in the years, left the band, would Tommy join? Would Tommy replace Steven when the actor goes on to tape season 2 of Lillehammer? Really, I think it is nothing more than Morello performed on “Wrecking Ball,” so here they were in his hometown and it seemed only polite to bring him along for the ride. If you want a blow-by-blow review of the show, read this one from Backstreets. If you want my review of the show, here’s what mattered to me: Bruce stopped right in front of us on the ramp and sang right to us four times. I touched his ankle and his calves, like a crazed fan would, I reveled in the feel of his drenched jeans, and I helped him as he crowd surfed over us. I helped Bruce Springsteen in a small way. Fitting, as his music has helped me numerous times. Hungry Heart —I touched Bruce and he sang right to me! Then he fell backwards on us to crowd surf. I held him by the ankle and looked up just to see his crotch right smack over my face. I resisted. Long Time Coming (solo acoustic)–he chose this sign over our inspired, “Burning Love.” But evidently on this leg, unlike others, he was not doing covers. Ooops. Darlington County–Bruce said, “Road Trip,” and brought Nils out the ramp. Nils looked like he’d rather be anywhere else other than a thin strip of ramp where crazed fans (like me) could reach out and grab him. Poor Nils. Waitin’ on a Sunny Day–The happy song that makes his fans angry, because not many of them like it…yet he keeps on singing it! Badlands (with Tom Morello)–My anthem. I loved that Tom Morello played on this. It was just perfect. Santa Claus is Comin’ to Town–He told everyone wearing Santa hats to get on the ramp and dance. They did. Tenth Avenue Freeze-out (with Tom Morello)–I touched Bruce again and I think by this point, he was sick of my hands and considered me a pervert. This entry was posted in Muses and tagged Springsteen, Tommy Morello. Bookmark the permalink.